The HDX 2n1 mini hacksaw cuts PVC, and wood. It features a durable and non-corrosive contoured dual material handle for easy gripping and storage of the integrated cable saw. The cable saw features handles on both ends which make it easy to use and great for tight spots. The multi-wire braided construction is designed to cut PVC pipe. Milwaukee Close Quarters Tubing Cutters are optimized for tough cuts in tight spaces. The compact design allows access to the tightest spaces. Chrome rollers deliver best in class rust protection while integrated weep holes allow water to drain from the tool. Directional grip allows better handling and quick identification of swing direction for easy use. Includes 1/2 inch, 3/4 inch, and 1 inch cutters and a storage case. The 2471-22 performs over 200 cuts on a single charge. A close quarter rotating head cuts installed copper tubing with as little as 1 1/2" of clearance. At 500 RPM, the patent pending cutting mechanism cuts copper tubing up to 10X faster than conventional cutters and automatically adjusts diameter to cut through 3/8" - 1" copper tubing (1/2" - 1 1/8" OD, Type K, L, and M). The inline design offers greater reach and reduced wrist strain in confined spaces. The metal cutting head is corrosion and rust resistant and is sealed for protection from water. Electronic overload protection and uni-body construction provide exceptional durability. Additional features include a battery fuel gauge, which displays the remaining run-time, and a built-in LED work light which illuminates the work surface. The versatile RIDGID No. 15 Screw Feed Tubing Cutter is designed to easily make clean, square cuts on copper, brass, aluminum and thin-wall steel. The steel tube cutter features a large, ergonomic X-CEL knob that provides a firmer grip so you can cut tubing more quickly and easily and it has a convenient fold-away reamer. This tubing and conduit cutter has a 3/16-inch to 1-1/8-inch cutting capacity. 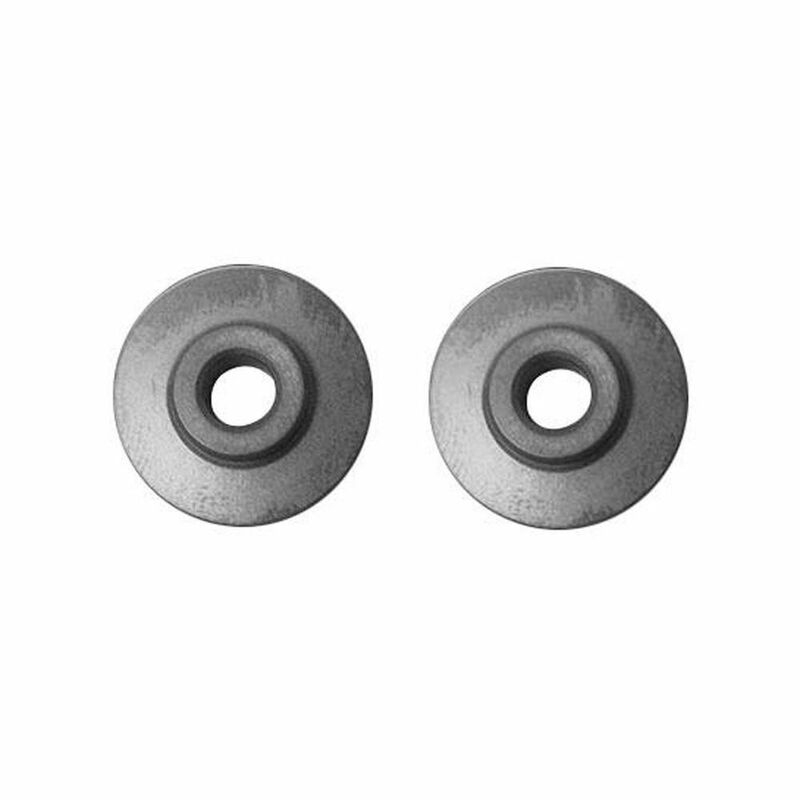 2-Piece Replacement Cutter Wheel Set is rated 5.0 out of 5 by 2. Rated 5 out of 5 by Windchimer15 from This tool works great. I ordered extra cutting wheels as... This tool works great. I ordered extra cutting wheels as a backup.